BTW, PMs or maybe even an old style listserver are pretty good for things not viable on open forums, ain't they ? And highlighting it can only make it even worse, ain't it? dencorso writes above, "... my main, day-to-day OS is XP SP3, and I'll cling to it until it becomes nearly impossible to use ,,,,"
Fortunately, I have free SpiderOak with 5GB capacity through Giveaway of the Day, and I put a copy of the spreadsheet into a folder that's backing up there, but I'm not a big fan of SpiderOak, and the SugarSync was actually my wife's account, so she won't be able to follow along easily any more on the particular spreadsheet I was working on. It's just as well that THE END IS APPROACHING. It's 7 for me VERY VERY SOON. It's looking for a procedure in Kernel32.dll that doesn't exist in the XP version. It may exist in Dibya's Extended XP, but you'll probably need to use Jumper's Import Patcher to patch the program to point that procedure to Dibya's .dll instead of the system one. That's just off the top of my head; it may turn out to be more trouble to fix than it's worth. 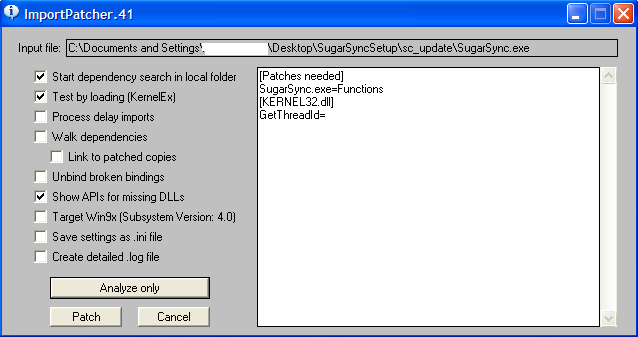 GetThreadId exists in NT 5.2 (Server 2003 and XP x64 edition). Mathwiz and someguy25 - On my XP Machine, on my Internet Explorer 8, when I go to Qualys to check whether its TLS 1.2 is working, I can't get to the page. That's at https://www.ssllabs.com/ssltest/viewMyClient.html. My Internet Options - Advanced shows that TLS 1.2 (and only TLS 1.2) is checked. So, what am I doing wrong? There were some posts here how to enable TLS 1.2 on IE8 on XP - please point me to them again. Good question. My IE8 displays "Internet Explorer cannot display the webpage" (unless I use ProxHTTPSProxyMII, in which case it's showing my ProxHTTPSProxyMII's capabilities, not IE8's). As I recall it used to work without it. Is that what yours is doing too? Edit: howsmyssl.com is doing the same thing. That site has an expired certificate, so IE8 will give you a warning; you have to click "continue to this site (not recommended)" to load the page. 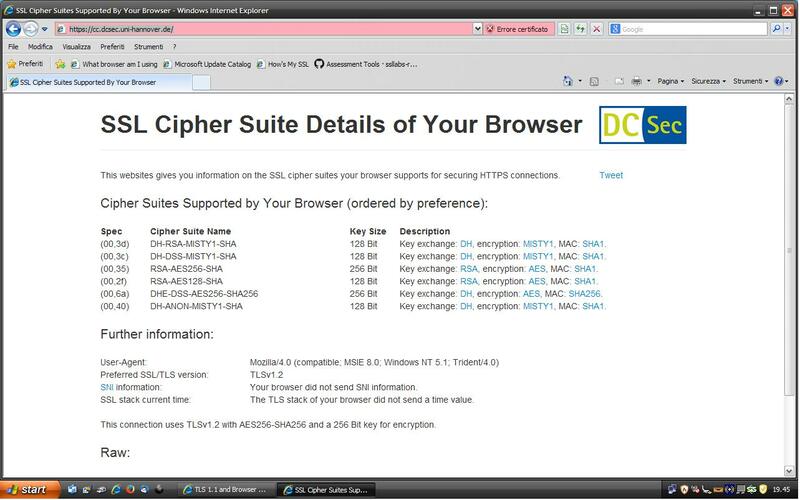 Also, it seems to be misidentifying the supported cipher suites. In my case they should all be AES or 3DES; no idea where it's getting "MISTY1." But at least it proves TLS 1.2 is working: "This connection uses TLSv1.2 with AES256-SHA256 ...."
It says IE8 doesn't send SNI (Server Name Indication). That may be why the other sites won't load. I am happy to report Automatic Updates found all 14 updates and they all installed without incident. One more Tuesday left for those playing along at home.